The society was invited to visit The Beeches Light Railway, Adrian Shooter’s private 2ft gauge line based on the Darjeeling and Himalaya Railway in India, in his garden. The day started out well with glorious sunshine, and a pleasant ride into north Oxfordshire. Whilst parking the car in an adjacent field the nostalgic sound of steam whistles could be heard, and it was not long before the sounds of a steam loco working could be heard, along with the squealing of the wheels on the tightly curving and steeply graded track. The gradient is 1 in 22 for part of the line, and 1 in 44 for another section. It was not far to walk, and then the magnificent sight, sound and smell of a 118 year old loco no 19, which was built by Sharp Stewart & Co in England in 1890 and worked the line for 71 years, hauling both passenger, goods and mixed trains. The loco was built an 0-4-0 with tank engine, but Adrian had a tender built to suit it, incorporating air brakes etc. When the loco was in India it ran as a tank engine, and required a crew of 5, driver, fireman, second fireman and two sanders standing on platforms (with a handrail) at the front. The line’s track plan is a figure of eight, with the outside edges also connected to form an oval. The layout is arranged so that two trains can run on separate circuits of the 8, as there are additional points and a double track section at the crossover. The line is constructed to a very high standard, using mainline wooden sleepers cut in half, and well set into the ballast. 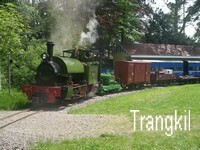 There is also an engine shed and a carriage shed accommodating all the stock undercover. There are 3 carriages at present, all built by the Ffestiniog railway for the line, a passenger, a passenger brake, and a parlor car based on one that ran on the Sandy River and Rangeley railroad in America, complete with end balconies, a kitchen, a dining room and a lounge for eight. There are also several goods wagons, both open and vans. Another coach is being built in his workshop. 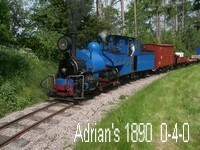 Adrian also has a number of other oil powered locos, for shunting etc. An excellent pig roast with salad and sweets was served, after Adrian had explained about his railway and how it came into being. Several of the other visitors there had helped in the design and construction of the line, but Adrian and his wife Barbara made us all feel most welcome, and happily answered all our questions. He runs the railway, as one would expect in a professional and safety conscious way, and could be seen thoroughly enjoying the day too. On the day of our visit one of his friends, Graham Lee had brought his 0-4-2 loco named Trangkil to the line, which was built by Hunslet in 1971, and is believed to be the last steam loco built by Hunslett. One of Adrian’s diesels was the last diesel built by Hunslet in 1994 which was used for the building of the Jubilee line in London, and he brought it out to pose beside Trangkil. Probably a never to be repeated photo opportunity. The two steam locos ran trains both goods and passenger during the afternoon, varying which was on which duty, and then towards the end of the afternoon the wagons from the goods train were attached to the rear of the passenger loco, and each loco pulled the complete train. Quite a load for little engines weighing less than 20 tons, on an incline of 1 in 22, and with a full load of passengers. There was a lot of black smoke emitting from the chimneys. For forthcoming Oxfordshire Railway Society Visits, please click here.